These students Love God & Love teenagers which is a powerful combination! They need our prayers as they continue to learn and grow not only in their faith but also in the skills needed to be excellent youth leaders! I've been using all kinds of examples to encourage them that what they are doing in youth ministry is so critically important. Many of them were really moved the other day when I showed the "Last Painting" Video clip and shared with them that without the clear descriptive words on the screen (Natasha Translated)to help guide us in what the artist's true purpose was for the painting, we'd be left up to our own conclusions...some would get it, some wouldn't...The descriptive words represent our role as youth leaders in the lives of students...speaking truth into the canvas of confusion and chaos that is youth culture. I encourage you to watch the video below and ask God to help you be a descriptor of God's truth to those you come in contact with. I also ask you to keep our newest class in your prayers...I've listed their names so you can have a clearly defined picture in your mind of some of the leaders that God is going to use to continue His work in the lives of Young People in Eastern Europe. Today was a very good day! Besides being National Pie Day (which is one of my favorite days of the year…especially when Banana cream is involved). We had an amazing discussion in class today. I used a similar angle as yesterday, in that I showed an inspirational video clip (see clip above) to set the context for the discussion. There were a lot of terms and concepts to go over again so I wanted to remind them of the importance of their critical role as a Youth Leader. 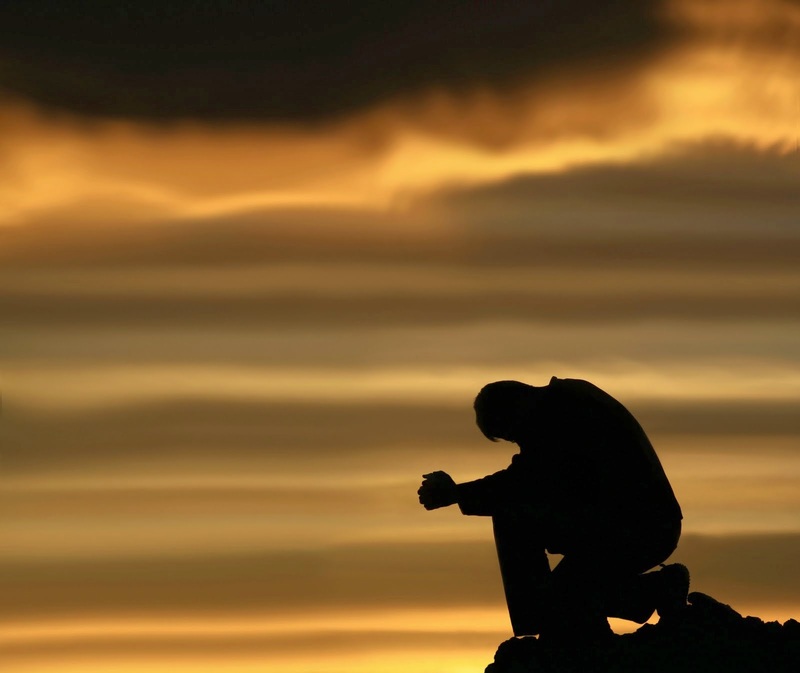 The fact is that because of our sin the perfect relationship that man once had with God has been severed, and God desires to have that relationship remedied, but can’t because He is Holy and we’re not…So that’s why He sent His son to pay our penalty and bring us back in relationship with Him. The enemy is doing all he can to hinder the reconciliation. He sends all kinds of distractions, temptations, traps & empty lies to lure us away…It’s a battle field! That’s where we as Youth Leaders find ourselves, speaking truth into the lives of the teens we work with so they will realize their need for God’s truth & love over the enemy’s lies & hate. It was awesome to watch them as they identified with temptations that were being portrayed and wrote down name after name in their notebooks…they were really into it…the best part of the exercise was when the character playing God in the skit bursts in to the scene and holds back the assailants & finally restores relationship with the student…talk about a powerful moment that really helped to set the stage for a lively interactive discussion not just about Youth Culture, but also about how important our role is in within it. I was very honest with them when I said there will be times in youth ministry when you feel like giving up. The teens don’t get you, the parents are mad you, the church is tired of you, and the enemy still hates you! In those moments though we need to always remember who we are in Christ & who He’s called us to reach, because it truly is a battle! I encourage you to take a few minutes and watch the clip if you haven’t already, and remind yourself how unfathomable God is and let what He did for you change the way you look at Him, and the way you look at people today. I don’t know about you, but the fact that Jesus is in the ring battling for me every day is an awesome picture. He not only loves me…HE FIGHTS FOR ME! • Today I taught the second session in the Youth Culture class. We covered the importance of understanding who we are trying to reach before designing programs to reach them. We looked at various components that serve to make up a culture…things like… symbols, language, economy, education, fads, fashion, and entertainment etc. We talked about some pretty technical things that one could start to get lost in, and potentially miss the point in all of the terms and definitions…SO… I began the class from a different angle. I mean, my problem has never been thinking that God is not big enough to handle my problems, issues and junk. For me it’s always been God is too big, and busy taking care of everything else He’s got to do to know about and care for me…Who am I? So we did this opening exercise to help the students begin to grasp the enormity of God and the unbelievable truth that He wants us to reach His people with His message…So, we need to understand who is people are and what makes them tick before we try the latest greatest technique to reach them. It was a very moving time, the students were really tracking with it, and when the video was over we shared our thoughts, and it was awesome to hear the passion in their voices (translated through Natasha). These youth leaders are driven, they were identifying individual students that they want so desperately to reach, and at the end of the sharing time, I closed with reminding them to let the fact that the “Creator of the universe loves them, knows them, called them and needs them to reach His people always be in the forefront of their minds & hearts, especially when things get tough…Like the definitions and terms that were going to talk about for the next 4 hours”…They laughed and laughed and it served as a good jumping off point into the material, and I think really connected with them today. I’m continually amazed with the passion that I see in the youth leaders I’ve come to know internationally…I’m not saying that youth leaders in the US don’t have passion, because they certainly do…I guess I’ve been around youth leaders in the US so much that the international perspective is just so incredible to me! The bottom line is youth today whether in the US or Internationally are looking for solutions, and I believe that youth leaders who know who they are in Christ, know who He wants them to reach, and are driven by God given Holy passion to reach them, are going to serve as Real life solution givers to help their young people know the REAL LIFE SOLUTION GIVER personally and begin to live John 10:10 style…Life to the Fullest! • I checked in to my room at the seminary today, and got settled in. It’s such a blessing to have a comfortable place to stay with access to the internet right in my room! As I sat in my room and checked e-mail I was reminded that I have this opportunity to update my friends on what God is doing in part because of the efforts of many of you who are reading this blog right now! • After settling in I met with the lady who will serve as my Interpreter for the class. Her name is Natasha and she and her husband Sergei both work as interpreters here at KTS. We spent some time getting to know each other, and work out specific words that we’ll need to use to communicate clearly to the students. One of the things that is fun but can be frustrating for me and for the interpreter is translating words and concepts from Russian to English and back again. I’m continually amazed (and jealous) of people who have this ability, I mean I can barely understand the way people who live in different regions of the US talk let alone interpret a whole different language…it’s a gift that I really appreciate! Anyway as we were talking I found out that she was at KCU which is where the Pastor that we ministered with the first time I came to Kiev teaches. So I asked her if she knew Pastor Volodymyr and she said with a hint of sarcasm “there are many Volodymyr’s in Ukraine”, to which I said “this one was a famous Russian rock star in the 80’s”. Her face lit up and she said “oh, of course Pastor Volodymyr!” and she went on to tell me all about him and how great his ministry is doing. It was incredible for me to listen to her talk about how he’s using his gifts (music especially) to spread God’s love all across Ukraine. As she talked my mind again went back to the investments that were made by praying people in the US (many from my former church) who gave sacrificially so that missions teams could help provide tools (guitar, drums, sound equipment to name a few) for his ministry to reach the people of Ukraine with the gospel. Pastor V has an amazing gift of music that he put on the shelf when he became a Christian, because the church leaders told him that music with instruments was not accepted in the church. Some people from our church found out about that and raised some money to buy him a guitar and he began using his gift again (after about 10 years of silence)…and the rest is History…his church is growing and he is using his God given gifts and abilities…talk about a win-win! At the end of the week though a couple team members and I sensed God leading us to pool our money together and purchase some studio time so that Pastor V could make a CD of his music to be used to bless others, and that’s exactly what we did…What a blessing it was to give him the money and explain why we did and what we were trusting God to do through him. So for me to hear Natasha talk about how his ministry is growing and how he’s using his gifts and his CD...WOW! So to that particular youth leader (and I know you're reading this, because you're still such an incredible encouragement to me), who was tuned in to God’s voice and made an investment in the kingdom 4 years ago…Guess what…It’s working!! • I taught my first class, and had a great time! I have 23 students from all over Eastern Europe (Ukraine, Belarus and Russia), and from 2-6pm we began our journey together into the complex field of beginning to understand youth culture. I began by telling them that we need to learn from each other because we all have insights to offer. It was a good first session, and I trust that God is going to continue to bring great things as we learn together. 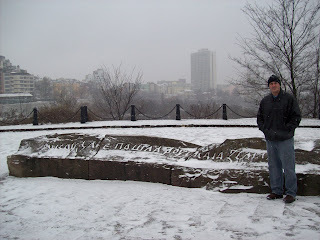 • The picture above is a rock that dates back thousands of years, it’s on the top of Ki’s hill (one of the brothers who founded Kiev), it basically says “from this rock come all Russians”. The history and traditions are so intriguing in this place, but I’m so privileged to take part in imparting tools that will help the youth leaders of this culture to share God’s truths with their young people in a way that they’ll really get it, and realize that God wants them to be a part of His family because our lineage is traced back to HIM! • 5:02pm I boarded a plane from Rochester, NY and flew to Detroit where I boarded another plane bound for London. I arrived in London with about an hour to spare before getting on another plane for Kiev, Ukraine. All in all it took about 12 hours of flight time and I was in a whole different world…Kiev. • I arrived about 5pm Kiev time and was met at the airport by YMI’s Eurasia Director, Mike Manna. Mike and I have worked together several times over the last few years, and it was good to see him (especially after being asked about 100 times if I needed a taxi). • We went to Mike & Judy’s apartment and had a wonderful dinner and just relaxed and caught up for the evening. • I’ll be staying at the Seminary starting Monday but for the weekend I’ll be with the Manna’s. 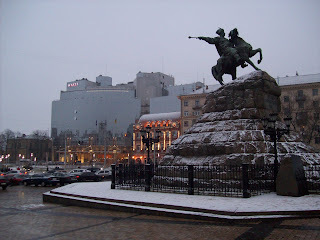 • After getting a chance to get caught up on my sleep, Mike and I went downtown to visit some of the historical sites in Kiev, and Mike gave me a very fun and informative walking tour of the monuments, museums, cathedrals and other interesting things that are all over the downtown area. I have noticed a considerable change since I was here last year…things like, newer cars, more modern looking buildings, hi-tech computers & flat screen TV’s and all kinds of things that were making Ukraine look more and more like Europe or the United States. It was very interesting to see the convergence of the old with the new in Kiev. I mean every where you look there are memories of an incredibly storied past that for centuries dominated the skyline of Kiev. Now right next to those memories are symbols of the here and now emerging to center stage. That is kind of how I view the youth of Eastern Europe, desperately wanting to emerge from the stereotypes and symbols that have shaped their identity in the past, and striving with every thing they have to be like teens in the west. The only problem with that is that many of these young people (like many teens in the US) are operating from a false assumption that says “stuff = happiness”, and we know where that assumption leads. That is why our work here in Kiev is so critical. The youth Pastors that we are training are serving as a solid voice of truth within the context confusing messages that are bombarding these teenagers every day. Please continue to pray that the class I'll be teaching on understanding Youth Culture will make an impact on these Youth Leaders. 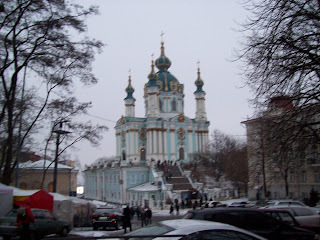 Well, in a few days I'll be heading back to a country that holds a special place in my heart...Ukraine! Why a special place you ask? Well, besides having amazing chocolates, gourmet Mcdonalds, and the best shish leek, on the planet. It is the place where God really got my attention with a certain statistic (97...3) and a very plain reality that He wanted to use me to join a team that was seeking to do something about it. I should've realized that God was going to do something that incredible summer of 2004, I mean before I left I had a sit down discussion and prayer time with 2 of my favorite people in the world (Brian & Joann Young), and in that prayer time they told me that they had been praying for me and really had the sense that God was going to do something huge and life changing in and through me on the trip. Joann had been reading the passage about Ezekiel and the Valley of dry bones and said she kept thinking about how she could see God doing something that only He could do in the lives of people and He was going to use me in the process...I was blown away, I didn't know what she meant, but I was ready for whatever God was going to do. The team and I set out for 2 weeks of life change in a foreign country, and what a trip it was. I saw God shake me, wake me, break me and take me to heights I had never been before. It was so moving that I returned from the trip believing that God wanted us to move to Ukraine and join the YMI team in Kiev by helping them train the next generation of professionally trained Youth Pastors in the former Soviet Union. Bonnie and I went back to Ukraine in the winter of 2005 for a vision trip, and realized that it wasn’t the place that God was calling us to, it was the ministry of training youth leaders internationally that He was calling us to. We joined YMI officially in 2007 and have been on the fast track ever since! Now I get the chance to go back and teach YM 102 – Youth Culture to a group of college freshman from all over Eastern Europe, and I’m really looking forward to seeing what God is going to do this time, as I return to the place where this whole missions thing got hold of me. Please pray for open hearts, open minds and a willingness to learn and grow. I leave Thursday 1/17 and will return 1/31…I will update the blog with pictures and insights of what God is doing in Ukraine. Thanks for partnering with me as we continue to close the 97…3 gap, by training trainers in youth ministry worldwide with YMI.